The standard electrical symbols are smart, industrial standard and vector-based for electrical schematic diagrams. 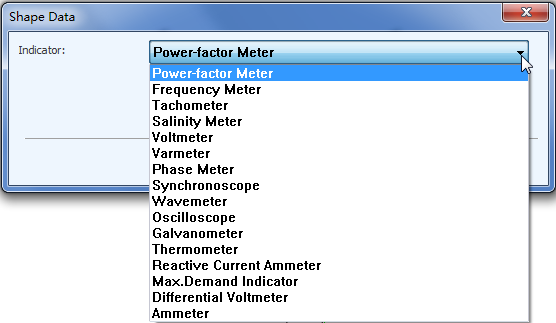 The following table lists some basic electrical symbols in our electrical drawing software. ground A connection to earth. Used for zero potential reference and electrical shock protection. equipotentiality Equipotentiality is a symbol to identify parts that have the same voltage (i.e. same electrical potential i.e. equipotential). Since equipotential surfaces all have the same voltage, you won't get shocked if you touch two such surfaces (unless of course you are also touching some OTHER part that has a different potential from the first two). chassis Connected to the chassis of the circuit. battery Supplies electrical energy. A battery is more than one cell. It generates constant voltage and represents a battery in an equipment package. resister A resistor restricts the flow of current, for example to limit the current passing through an LED. A resistor is used with a capacitor in a timing circuit. attenuator A box with input and control logic on one side, and output on the other. capacitor A capacitor stores electric charge. A capacitor is used with a resistor in a timing circuit. It can also be used as a filter, to block DC signals but pass AC signals. accumulator Accumulators are designed to increase or relieve pressure in the system. antenna A antenna is a radio antenna that can be made of a simple wire, with a center-fed driven element. loop antenna A loop antenna is a radio antenna consisting of a loop (or loops) of wire, tubing, or other electrical conductor with its ends connected to a balanced transmission line. crystal A crystal oscillator uses the mechanical resonance of a vibrating crystal of piezoelectric material to create an electrical signal with a very precise frequency. circuit breaker A circuit breaker is an automatically operated electrical switch designed to protect an electrical circuit from damage caused by overload or short circuit. fuse A type of sacrificial overcurrent protection device. Represents low voltage and power fuses. inductor A coil of wire which creates a magnetic field when current passes through it. It may have an iron core inside the coil. It can be used as a transducer converting electrical energy to mechanical energy by pulling on something. It is a passive two-terminal electrical component used to store energy in a magnetic field. explosive squib Explosive squib is often used on stage and film to trigger various special effects. instrument For example, a voltmeter is an instrument used for measuring electrical potential difference between two points in an electric circuit. The wattmeter is an instrument for measuring the electric power in watts of any given circuit. delay element Delay element provides a specified delay between actuation of the propellant-actuated devices. permanent magnet A permanent magnet is a material or object that produces a magnetic field. bell The electric bell is found in a normal house doorbell, and when activated it makes a ringing sound. buzzer An electrical buzzer is similar to the bell, but instead of a single tone or bell sound it makes a constant buzz noise. lamp A transducer which converts electrical energy to light, which is used for a lamp providing illumination, for example a car headlamp or torch bulb. speaker A speaker can take digital input and turn it into analogue sound waves. One of the most important parts of a wide range of electrical products like TVs and telephones. oscillator Produces a repetitive electronic signal, often a sine wave or a square wave. AC source Alternating Current, continually change direction. DC source Direct Current, always flow in one direction. The electrical symbols for most major basic electrical components can be found in the above table. However, each electrical component may have numerous possible representations. The electrical symbols can vary from country to country nowadays, but are to a large extent internationally standardized. Some electrical symbols become virtually extinct with the development of new technologies. In cases where there is more than one common electrical symbol, we have tried to give an alternate representation. This group of symbols is located in the Engineering category in the Available Templates list. After you start Edraw, click the icon of Basic Electrical Symbols to open the stencil including this kind of shapes. The stencil panel is opened on the left along with a blank canvas on the right. Drag the shape you need directly onto the canvas. Instead, you can click its icon and then click on the location where you want to place it. After you add shapes on the drawing page, they are selected by default. So you can resize them by dragging the green selection handles. A double sided arrow shows the direction to which you can move the mouse. Move the shape when a four-direction arrow appears. In electrical diagram software, you can use the action button to choose the right electrical symbols with one click. It shows when the shape is selected or when the pointer is over the shape. For example, the Variable Resister can be turned into 6 more kinds of symbols by clicking the button. If many options are available, a dialogue box may be designed. Click the drop down menu to find necessary choice. 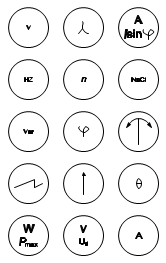 For instance, an Indicator shape includes 16 options. To know more about basic electrical circuit, please go to basic electrical circuits page for details. Also, check out simple electrical circuits introduction for more information. To learn electrical circuits from four examples here.